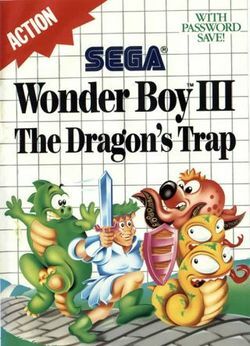 Wonder Boy III: The Dragon's Trap (Monster World II: Dragon no Wana in Japan) is a 1989 game for the Sega Master System. It is a direct sequel to Wonder Boy in Monster Land (Wonder Boy III: Monster Lair is ignored), and it is the first in the series to be made solely for consoles. The game opens with the player, Hu-Man, repeating the final boss battle of the previous game. When defeated, however, the dragon curses Hu-Man to become a dragon himself. Now Lizard-Man, the player must search for a cure. During this quest they will encounter other dragons and in turn be cursed with other forms. Near the end of the game the player earns the ability to change between forms at will. Westone licensed their portion of the game to Hudson Soft, who released a TurboGrafx-16 version called Dragon's Curse on April 19, 1991. In Japan this version was called Adventure Island, despite it sharing no gameplay similarities with Hudson's usual Adventure Island games. This version's graphics were upgraded to 16-bit. The main changes were Lion-Man being replaced with Tiger-Man (who plays identically) and Hu-Man being changed to resemble a baby-like figure; contrary to popular belief this iteration was not intended to be a girl, as he is still called Hu-Man and the ending uses "his". It also featured disk saving in addition to password saves (TurboGrafx passwords are incompatible with Master System/Game Gear passwords) and a slightly extended ending. A Sega Game Gear version was released in 1992. Because the Sega Mark III (Japanese Sega Master System) was cancelled in Japan before this game's release this was the first time Japanese players got to enjoy this game. Because by this point Wonder Boy III: Monster Lair had been released in Europe, the European version omitted the "III" to avoid confusion. The Game Gear version has some changes from the other two versions; the game world was altered to fit on the smaller screen, and Charmstones (normally required to make shopkeepers sell better items) are instead used to teleport the player back to the village at will. Like other games in the series, Sega's Brazilian distributor Tec Toy replaced many game sprites with characters from Monica's Gang (Turma da Mônica in Brazil) and released it as Turma da Mônica em o Resgate. Rather than transforming into monsters the player instead turned into different characters from the gang, and the bosses were replaced with villains from the comic. This version was only available for the Sega Master System and only in Brazil. The game also appears on the PlayStation 2 in Japan as part of Sega Ages 2500 Series Vol. 29: Monster World Complete Collection. The TurboGrafx-16 version was re-released for the Wii Virtual Console on March 30, 2007 in Europe and on April 2, 2007 in North America. This page was last edited on 27 June 2012, at 04:49. This page has been accessed 36,683 times.